Woman human rights defender Atena Daemi was beaten by agents of the Islamic Revolutionary Guards Corps (IRGC) in Tehran’s Evin Prison and then transferred to Gharchak Prison in the city of Varamin on 24 January 2018. 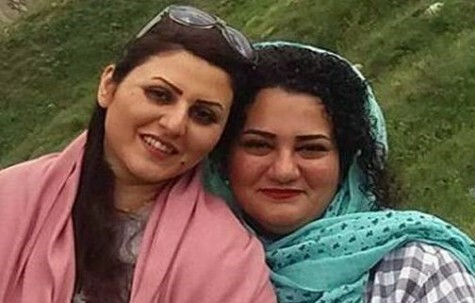 Daemi was transferred to the prison in Varamin, 37 miles south of the capital, along with Golrokh Ebrahimi Iraee, an accountant and writer who is the wife of imprisoned human rights defender Arash Sadeghi. On 19 March 2018, alarmed by reports that Daemi and Iraee were beaten in jail, four United Nations human rights special procedures issued a statement in which they expressed concern at the continued targeting of human rights defenders in Iran. The statement was issued by Michel Forst, the Special Rapporteur on the situation of human rights defenders; Dubravka Šimonovic, the Special Rapporteur on violence against women, its causes and consequences; David Kaye, the Special Rapporteur on the promotion and protection of the right to freedom of opinion and expression; and Nils Melzer, Special Rapporteur on torture and other cruel, inhuman or degrading treatment or punishment. Daemi, a 29-year-old woman human rights defender and anti-death penalty activist, has been serving a seven-year sentence since November 2016 after being convicted of charges that were based solely on her peaceful human rights activities. She was sentenced on 29 September 2016 with three other people to “assembly and collusion against national security” and “insulting the supreme leader.” The charges were based on her meetings with the families of political prisoners, criticising the Islamic Republic of Iran on Facebook, campaigning against the death penalty, and condemning the 1988 mass executions of political prisoners in Iran. Daemi has been repeatedly persecuted for practicing her basic rights. She was previously beaten and pepper sprayed during her arrest. On 08 April 2017, she started a hunger strike in protest. However, her health quickly deteriorated and she did not react well to the needed medical care. Daemi was previously arrested on 21 October 2014 for similar charges, and spent several months in prison and kept for 51 days in solitary confinement during her imprisonment for no clear reasons. Iraee has been in prison serving a six-year sentence since October 2016 for “insulting the sacred” and “propaganda against the state,” primarily for writing an unpublished story about stoning that was confiscated during a raid of her home by the Revolutionary Guards. The raid was targeting Iraee’s husband, who is serving a 19-year sentence. On 08 July 2017, Daemi and Iraee wrote a joint letter describing Evin Prison after foreign ambassadors were given a staged tour of certain sections of the facility without visiting any political prisoners. “Did they tell you about unsanitary conditions and women’s health? Or about the conditions inside the clinic where they prescribe wrong medications? …Do you know how many hundreds or thousands of inmates suffer from kidney problems because of the prison’s unhealthy water?” they wrote, noting a lack of female nurses and doctors to treat women prisoners.